It's 2020, and a magical cataclysm has shattered reality as we know it. Now a wizard's cabal is running the East Coast of the US, keeping a semblance of peace. Their most powerful agents, Edmund and Istvan -- the former a nearly immortal 1940s-era mystery man, the latter, well, a ghost -- have been assigned to hunt down an arms smuggling ring that could blow up Massachusetts. She is the proud owner of a BA in English and Spanish from the University of Idaho, which thus far has not proven terrifically useful for job prospects but she knew the risks of a humanities degree going in. She also survived the 8.8 Chilean earthquake in 2010, which occurred two days after her arrival in the country (being stubborn, she stayed an entire year anyway). 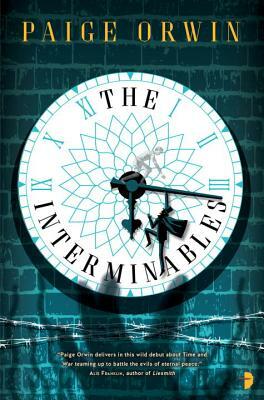 "The Interminables is a type of science fiction/fantasy that I love. It doesn’t dwell too much on the how’s of the situation, but jumps head first to the what’s, who’s, and why’s of the story."